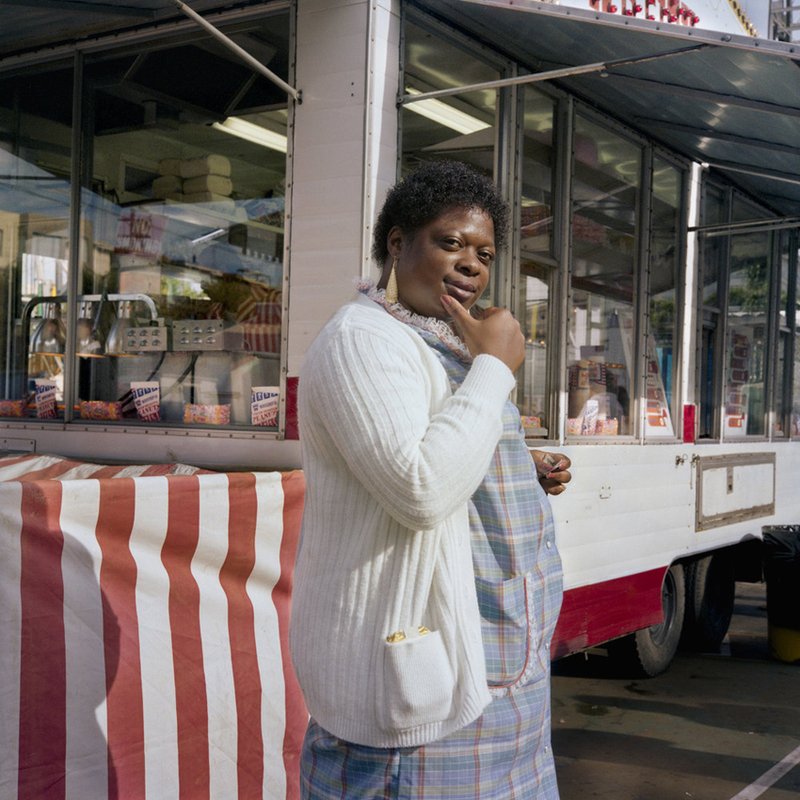 Janet Delaney moved to the Mission in 1982 from the South of Market neighborhood, where she’d spent the last several years photographing and interviewing the people in the area whose homes and businesses were being demolished to make way for Moscone Center. The SoMa photographs were formal and composed, taken with a view camera that used 4×5 inch negatives—the kind that professional photographers have used since the 1900s. 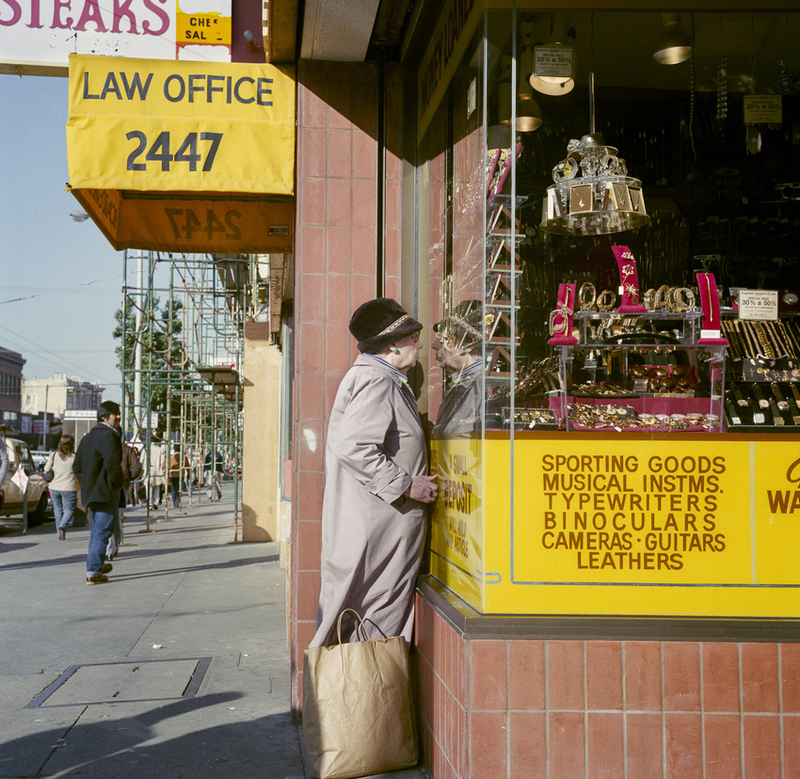 Delaney was just a student at the time, but ultimately, photos from that series would become part of the permanent collection at SFMOMA—one of the developments that replaced the SoMa she was photographing. 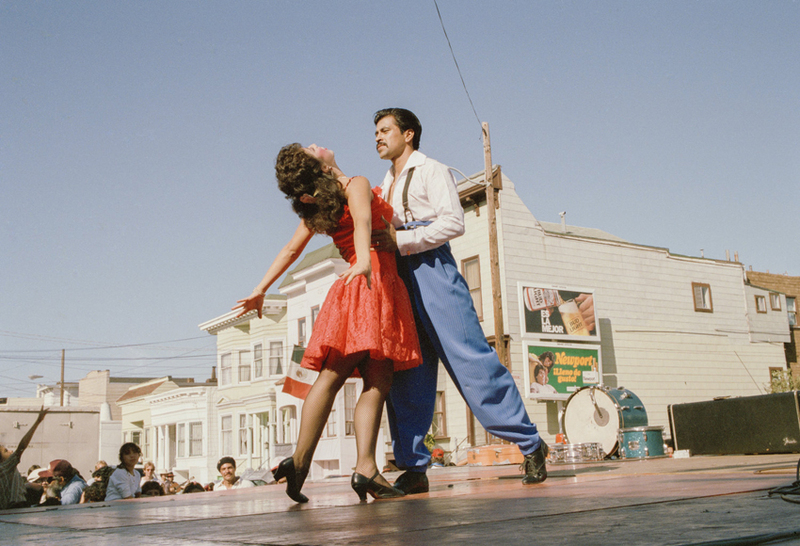 The Mission was different—a full-fledged neighborhood that no one was trying to build a convention center on top of. 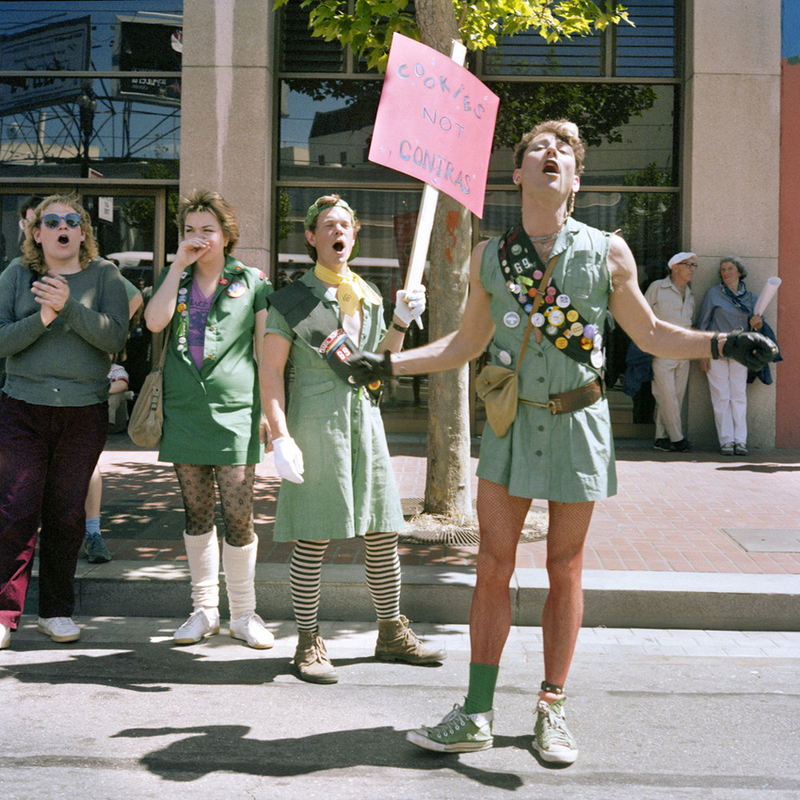 When Delaney went out to explore, she took a 35 mm camera or a twin-lens Rolliflex, both of which were small and light enough to carry through a crowd, where she took spontaneous, unposed photographs, using color negative and slide film. When Delaney moved to Berkeley in 1988, she put the photos into storage, not sure of what to do with them. 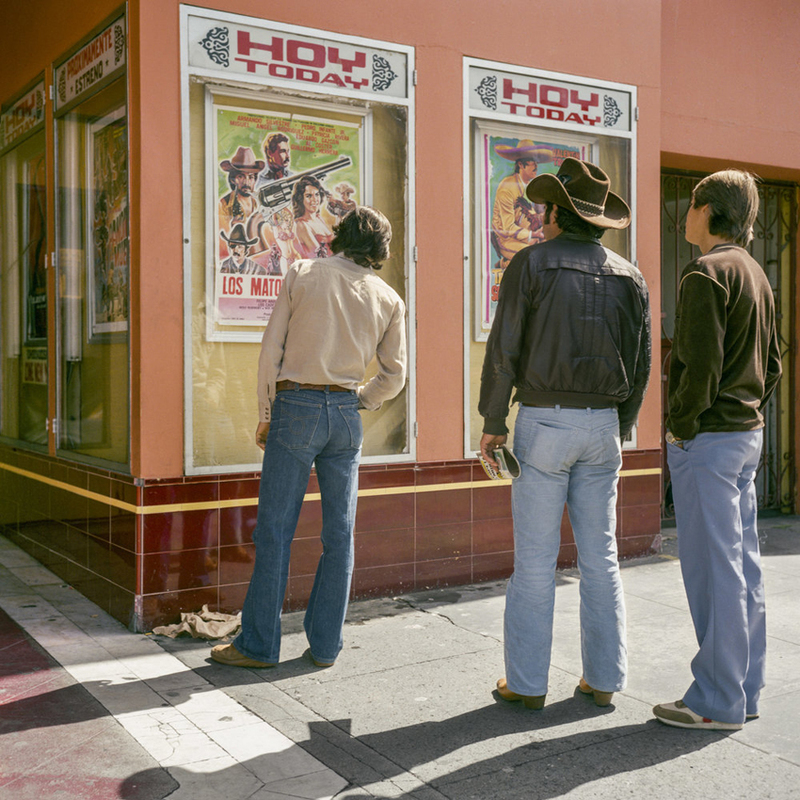 Two years ago, while she was scanning slides from her original South of Market project, she found the Mission photos again. Nearly three decades had gone by. This time, when she looked through them, a story began to emerge. The resulting show, Public Matters, is showing at the Equinom Gallery at Alabama and 25th. To those of us who are used to seeing this era in the Mission represented by family photos and snapshots, it’s a revelation. Recently, Delaney spoke with Mission Local about why she chose to show these photos now. Mission Local: What was it like to move to the Mission after being in SoMa for so long? Janet Delaney: I couldn’t really afford to live South of Market anymore, even though it didn’t look that different. The rents were going up in anticipation of the new Moscone Center. So I rented a little house—emphasis on small. It was three rooms but I had a basement that was the same size as the house, so I was able to build out my studio. I had huge black and white and colored darkrooms in there. I’ve always had darkrooms. When I lived in South of Market I had taken my bedroom and turned it into a darkroom. I had this cottage industry in this little house. I would print for other people, and I would rent out my darkroom to other artists. It was one of the many ways I made a living—I was also teaching photography and working as a documentary photographer for a company that did advocacy documentaries for nonprofits. ML: When you were in the Mission were there a lot of protests going on? I photographed protests during that period of time in black and white for various local newspapers. I didn’t include that work because I was looking for a different sensibility in the exhibition. They didn’t quite fit in with the work that got to the wall. If you look at the book and the show there’s really only two big protests that are featured. One of them is the Peace, Jobs, and Justice parade, which would happen fairly frequently. It was kind of like a one stop shop for protesting—AIDS awareness, nuclear disarmament, the invasion in Nicaragua, homelessness. People were taking to the streets on a regular basis. There seemed to be a really large and continuous effort to bring attention to all these political issues. Reagan had certainly gotten people’s attention. ML: Was there like the same sense of surprise that somebody like that could suddenly be president? I guess Nixon wasn’t too far in recent history. We weren’t inundated with absurdities as we are now. Reagan had a smoothness to him. He was called the Teflon man. He had a way of massaging the message so that people could sort of swallow it piece by piece. He pretty quickly rolled back a lot of what the gains had been in the ‘70s. He stopped the U.S. government from supporting women’s right to abortion everywhere outside of the United States. He appealed to a lot of middle of the road Democrats who switched over to the Republican Party. But at the time, everyone in San Francisco was well aware of what was happening. ML: Are there any of the places that you used to go to in the Mission that are still around? Any favorite haunts? I was always at Galeria De La Raza. I’m troubled by that turn of events. I would regularly go to Santa Jose Taqueria or La Victoria bakery. I was walking distance from 24th Street. I lived above what was then Army on Folsom, near Precita Park. So it was the edge of the Mission, the beginning of Bernal Heights. 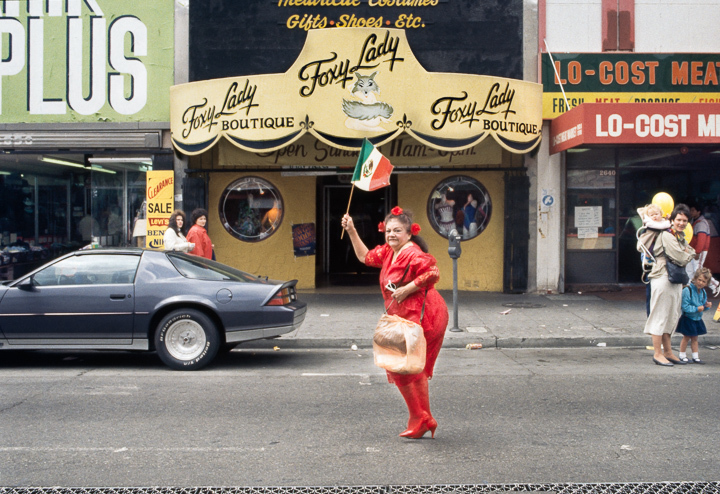 ML: The Foxy Lady boutique is still there. There are a handful of things that persevered. When I drive through the Mission I don’t really notice change. It’s when you walk on the street that you start to see the little storefronts that have, as they say, been “curated.” You walk in and they’re selling six things. ML: When you were photographing SoMa, that was very architectural in some ways. 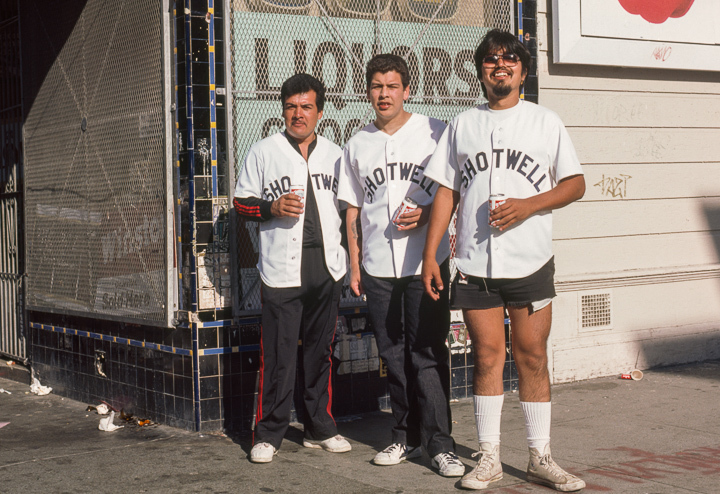 And when you were taking photos in the Mission, you didn’t seem to necessarily be thinking of the same audience. Who were they for? The South of Market project was really looking at where people live and how people live. There are portraits, and there are narratives that go along with those stories that they’re telling. You can see all the photographs on my website because the book went out of print so I posted everything—but the book itself actually has a whole series of interviews that I did with many of the people who are pictured in the book. But I really used the construction of the Moscone Center as the protagonist to the narrative that I was creating. I was interested in how that space was changing. and using that as a point of entry to the concept of gentrification. So when it came time for me to move out of my little apartment on Langton Street where I had really built that project and I moved into the Mission, I put aside the view camera. I was still going back and using that big heavy camera in South of Market as I was finishing up that project, but I no longer lived there and I felt an emotional distance. I was at the time deep into a different project that was getting going in Nicaragua—I was documenting this family that lived in Managua. 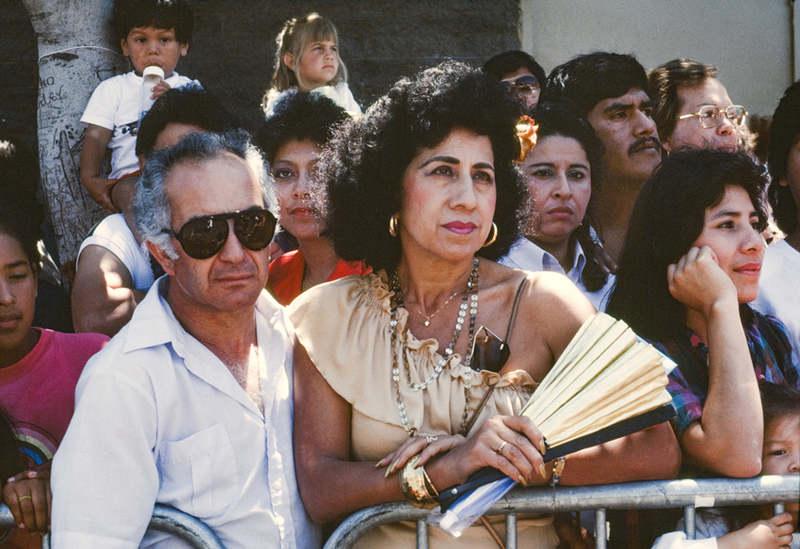 I made trips in the summers to visit a family and to record their story and to bring that back in response to the way in which the U.S. government was supporting the opposition to the new regime in Nicaragua. Meanwhile, back in the Mission, it was a neighborhood where things were happening, and I was just out on the street taking pictures. I didn’t have an agenda about what I was doing. It was like a new relationship. I never actually did anything with the work–I just put it away, like you would a family album, for later. Then, years later, I thought “There is a story here.” And I spent two years sorting through it and trying to find that narrative and tried to find the juxtaposition of photographs that would tell that story. All this work is not just the Mission, although it’s easier to talk about it if we assume it’s “The Mission”. It’s really about the way in which the city as a whole is undergoing this massive transformation, where we’re getting a huge influx of immigrants from Central America but also the African-American population is disappearing. As you look at the book you’ll start to see things that you’ve probably not seen in a while. A lot of African-Americans at the farmer’s market, a lot of African Americans at the fairs and the parades and on the street. That was an important issue for me. I just want to look at how the city is evolving. How do we structure a city so there’s room for everybody, and we don’t just devolve into a very expensive island? ML: Have you ever found a city where it seemed like there was room for everybody? Back in the ‘80s we had a bit more. Where would that happen now is a really good question because this problem is everywhere, right? Every big city is experiencing expensive housing prices. I can’t very well address the problem beyond, as an artist, bringing attention to what the community has been. I can only just raise the flag and be a reminder for people coming in now about the nature of it. I think one of the reasons why I brought this work out now was that I had been working on my new project, SoMa Now. I was thinking about how the city is changing so rapidly, and what was it like back in the ‘80s. That interaction on the street is so important—being comfortable with people that are different than ourselves. Being at home with strangers. ML: Has anyone recognized themselves or their families in your photos? Not a lot yet but I suspect they will. 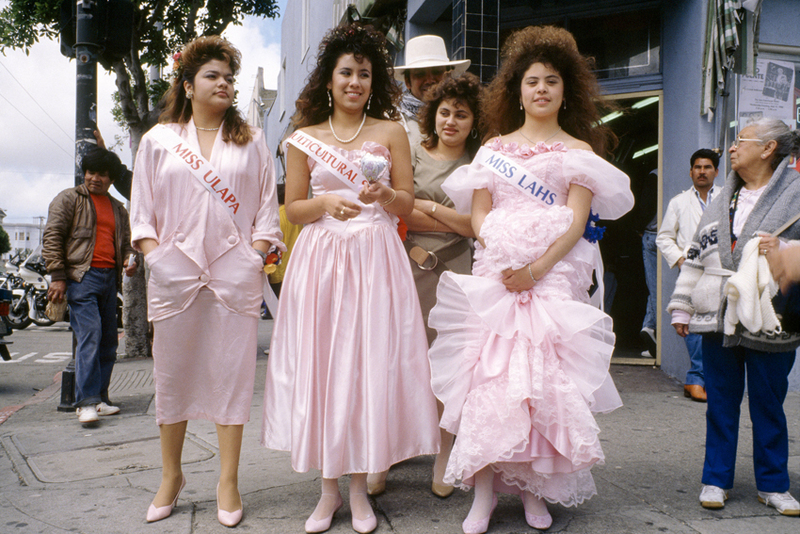 The three women in pink—the three contestants at Carnaval—The son of the woman in the middle found that photograph I think in the New Yorker article. She was going to come by the gallery. I haven’t met her yet but I will track her down. ML: Has the prevalence of cameras changed how you take photographs in public? First let me say this: If you work taking pictures on the street, you’ll notice that the majority of those kinds of pictures are made in cities where there’s a big crowd. That what really gives you the kind of freedom to photograph strangers. That was a little harder to get when, for the most part, San Francisco was quiet enough that if you were lurking about with a camera you looked somehow suspicious. When I was making these pictures in the 1980s, there were always a couple of other guys who would also be photographing. Then I would see their pictures in a magazine or the newspaper—they seemed to have a hold on how to get their work out into the press. And I just hadn’t figured that part out. But there were only like three or four of us running around with a camera. There was a certain kind of need I felt—making pictures for myself, for that experience of knowing that that stuff had been recorded. Now, maybe not so much, now that everyone has a camera on their phone. How do you feel about San Francisco now? I no longer live in the Mission. I still miss the Mission. I have such unresolved feelings about having to leave the city. it’s just never quite—I was just thinking as I was driving back into Berkeley just now how I know Berkeley has treated me well. My daughters had a good public education and I got to teach at UC Berkeley. But I think sometimes where you fall in love is where you want to live. To me San Francisco was my home. So I guess I’m just going to have these long term relationships at a distance. San Francisco was this quaint little village, and people thought of it as cute, but now it’s a powerhouse of tech. When I decided to bring this work out now, it was to remind the community at large that there are a lot of other things that are valuable in San Francisco. The culture of protest and the culture of immigration and of accepting difference hopefully also starts to become integrated into the way the culture of technology moves forward. So place matters. I think that’s the thing. Where we live still needs to be able to have a persona and not just become every city. Public Matters is up at the Equinom Gallery through December 22nd, and open Wednesday through Saturday, 10-5pm. Janet Delaney will give a talk about her work and sign books on Thursday, November 29, 6-8pm. A poetry reading with Tongo Eisen-Martin, Cathy Arellano, Valentina Lopez Cortes, and Josiah Luis Alderete will happen on Saturday, December 1, 3:30-5pm. Copies of the book are available at Equinom, Alley Cat Books, and other local bookstores.